"When we learned that last year — that about 40 percent of people were never getting employment or continuing their education — we wondered, 'Why is that, and what happens to them?' "
But those idiosyncrasies sometimes mask hidden talents, she says — like intense focus, or a facility with numbers and patterns. "I mean, look at what happened with the housing bubble and the financial market," she points out. "It was a man on the spectrum who saw which mortgages were going to fall. And I don't think that's something an average person would have been able to do." Still, with baby boomers starting to retire, and with talent in increasingly short supply, companies as varied as Microsoft, Walgreens, Capital One, AMC Theaters, and Procter & Gamble are all starting to actively recruit people who have autism spectrum disorder. They aren't yet putting a lot more people to work, but their recruiting and training programs are becoming models for other firms. Take, for example, Bank of America's support center in Dallas, which prints, checks and sorts reams upon reams of paperwork regarding bank customers. The work involves, as manager Duke Roberson says, "a lot of paper handling." All the members of Roberson's staff of 75 have some form of disability. His workers with high-functioning autism, he says, tend to be aces at catching errors — and they enjoy the repetition. "I tell my guys as we start in the morning, 'We do the same thing the same way, every day,' " Roberson says. Turnover within Roberson's team is incredibly low, and performance, profitability and morale are good. "There's no charity to this at all," he says. 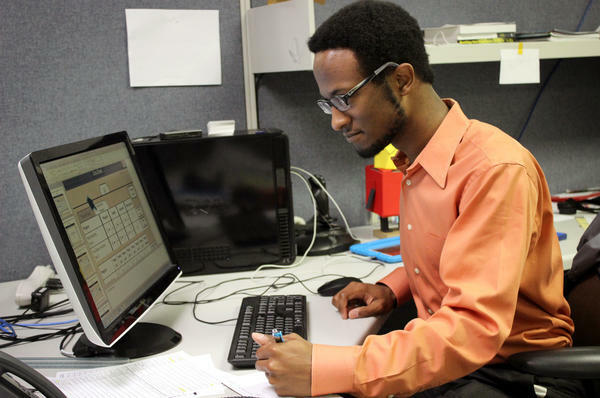 The company Specialisterne USA helps people with autism find work as consultants "in information technology and other sectors with technically oriented tasks and jobs," its website says. Executive Director Mark Grein says accommodating a worker with autism is often as simple as adjusting lighting to prevent overstimulation or permitting frequent breaks. "Our recommendation is just clear communication in terms of expectations," Grein says of his advice to companies. "Be able to provide rules." It also helps, he says, to train co-workers beforehand, and to provide a mentor who can help the worker with autism ease into the workplace. Grein says he has successfully placed hundreds of workers and hopes to eventually reach a goal of 250,000 people. Getting past the obstacles of a conventional job search, however, can be hard. Last year, Autism Speaks launched thespectrumcareers.com, a website to match workers who have autism with prospective employers. Gerald Franklin, who is 24, is the website's lead developer. Among other helpful aids, he says, the site allows job seekers to post videos. He was diagnosed with autism at age 4 and says he has developed workarounds over the years for communicating with his team without long explanations. Young adults with autism spectrum disorder often struggle to find work, more so than people with other intellectual disabilities. Autism can make communicating and socializing difficult, but many people who have it are high-functioning. With an estimated 50,000 people with autism turning 18 each year, some employers are starting to see them as an untapped talent pool. NPR's Yuki Noguchi reports. YUKI NOGUCHI, BYLINE: Anne Roux was baffled by a statistic in her own study on autism in young adults. ANNE ROUX: When we learned that last year - that about 40 percent of people were never getting employment or continuing their education - we wondered - why is that, and what happens to them? NOGUCHI: Roux is a research scientist at the A.J. Drexel Autism Institute in Philadelphia. ROUX: I think that this generation of students and their families has a different set of expectations around inclusion, around independent living. NOGUCHI: But services to help them transition to adulthood aren't robust. And if this growing population doesn't find work, it's a strain on families and the social safety net. Leslie Long agrees. LESLIE LONG: Once you develop into an adult, those resources plummet. NOGUCHI: Long is vice president of adult services for the advocacy group Autism Speaks. For those on the spectrum, face-to-face interviews can be a challenge. Many engage in repetitive behaviors, which can seem odd, but, Long says, idiosyncrasies can also mask hidden talents, like intense focus or sometimes a facility with numbers and patterns. LONG: I mean, look at what happened with the housing bubble and the financial market. It was a man on the spectrum who saw where the mortgages were going to fall. And it was something that I don't think an average person would be able to do. NOGUCHI: The case of self-diagnosed autistic hedge fund manager Michael Burry, who is featured in the book and movie "The Big Short," is in many ways exceptional. But, Long says, as baby boomers retire, and with talent in increasingly short supply, companies such as Microsoft, Walgreens, Capital One, AMC Theaters and Procter and Gamble are all starting to actively recruit those with autism. They aren't yet putting a lot of people to work, but their programs are becoming models for others. DUKE ROBERSON: ...A lot of paper handling. NOGUCHI: Roberson's staff of 75 all have some form of disability. His workers with high functioning autism, he says, tend to be aces at catching errors and enjoy repetition. ROBERSON: I tell my guys as we start in the morning, we do the same thing the same way every day. NOGUCHI: What others might find monotonous, they find comforting. ROBERSON: I have one individual that - when he comes in, he has to have the same seat every day, or it kind of upsets his whole day. NOGUCHI: Roberson says turnover is incredibly low and performance, profitability and morale are good. ROBERSON: There's no charity to this at all. NOGUCHI: Getting past a conventional job search, however, can be hard. Autism Speaks launched spectrumcareers.com, a website to match workers with autism with prospective employers. Twenty-four-year-old Gerald Franklin is the site's lead developer. Among other things, he says the site allows job seekers to post videos. GERALD FRANKLIN: Video played a huge role in helping people with special needs showcase what they can do and also have them talk about their qualities. NOGUCHI: Franklin himself was diagnosed with autism at age four and says he's developed workarounds for communicating with his team. FRANKLIN: I would try to explain something really cool or interesting to someone, but they did not understand. So it would be making lots of drawings, making lots of notes, and my team members are extremely appreciative for it. NOGUCHI: Franklin sees his autism is an asset. It gives him insights, he says, so he can design tools to help others like him. Yuki Noguchi, NPR News, Washington. Transcript provided by NPR, Copyright NPR.